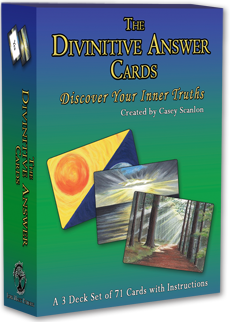 The Divinitive Answer Cards are a fun, heart centered, 3 Deck card system designed to help with tough decisions or choices. They help you find the answers you already know in your gut, but can’t seem to put your finger on because your head gets in the way. They don’t give you the definitive answer. You divine your own answer, so you get The Divinitive Answer! The Divinitive Answer Cards were conceived of in 1998 when Casey was living in the Blue Ridge Mountains. They were a culmination of thoughts from an article she read about a tough decision, and a conversation with a beloved friend who always looks outside himself for his answers, combined with the fact that Tarot cards were gaining popularity in the mainstream and all of her friends had decks. Casey had the thought that she could make her own deck, but it would be different from Tarot. It would be just for decisions or tough questions. The cards were based on Casey’s belief that we already have the answers to any question we could ask, deep inside us. The article she read gave her the idea to begin with YES or NO card. A decision can always be reduced to Yes or No, and there is a raw response in your gut when you hear Yes or No. But it isn’t always as easy as Yes or No, so her beloved friend suggested adding a percentage value to the Yes or No. She liked that, so the Percent Card was born, in 5% increments from 5 to 100. And to finish it off, she thought she would write all of the answers she could think of that she had inside her…just to see what they were at first. There were 30 of them. The cards were originally going to be just for Casey’s private use, so the Answer deck stemmed from her point of view. She made a prototype deck and then shared them with some friends. It was remarkable how they seemed to work very well. They were very fun and most people’s first reaction was laughter! Casey began to see that the cards would work for anyone, not just her and her likeminded friends. They were universal. Through continued play with old friends and new subtle changes were made to the answer cards. They developed through the years to be more balanced in their positive and negative responses, to include less self- oriented answers and to have a few neutral answers. These neutral answers arose to support the new blank card that evolved into the Yes No Deck when Casey, playing with a new prototype for a friend, accidentally left one of the Yes No Cards blank. The blank card was pulled in answer to a question, but it made perfect sense to the person asking. So it found a permanent home. The decks just sat and “simmered” for a number of years just being used by those in Casey’s inner circle. But they stayed on that back burner awaiting their time. Each time they were brought out as an appetizer they always got a good reception, so finally it is their turn to be the main course! Copyright ©2013 Casey Scanlon. All Rights Reserved. All images are copyrighted and not to be used without permission.